Labels: Recipes Posted by Yann_Chef on at 11:08 a.m. 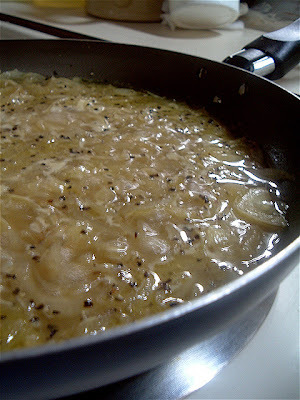 The sauce soubise or onion sauce is dedicated to the Marechal de France Charles de Rohan, Prince de Soubise who like a lot aristocrates of his time (XVIII's Century) was very interested in culinary arts. This classic French sauce is based on a bechamel in which is added an onion puree. 21/2dl (1 cup) clear veal or chicken bouillon, or 21/2dl milk. Peel and wash the onions. Slice them as finely as possible. If the onions are old, blanch them. Otherwise, put them in a thick bottom saucepan with 40g of butter and stew them gently (sweat off), covered, for 20-25 minutes (without coloring them). When this is done, stir in the flour, allow to cook for 5 minutes. Stir in the bouillon or milk and add the seasoning. Bring gently to the boil while stiring constantly. Cover and let the sauce cook, at a very gentle simmer for at least 45 minutes. Stir from time to time. Force the sauce through a chinois and put back on the heat. Then add the rest of the butter and the creme fraiche. Let the sauce cook for another 5 minutes. Check the seasoning. Set aside in a bain-marie until serving time. "Make [food] simple and let things taste of what they are." Suitable for pregnant women, lactose intolerant (if using the bouillon), Coeliacs replace the flour with rice four, nut free.